A navy to defend the South's waters and to prey on Northern shipping was authorised on 16 March 1861. In late 1864 it numbered 700 commissioned and warrant officers and 3,674 enlisted men, probably its peak strength. Despite a lack of shipbuilding facilities, the Navy launched 37 ironclads, the most famous of which was the CSS Virginia, better known as the Merrimac. This was the first ironclad naval ship in American waters, and its battle with the Northern Monitor changed naval history. 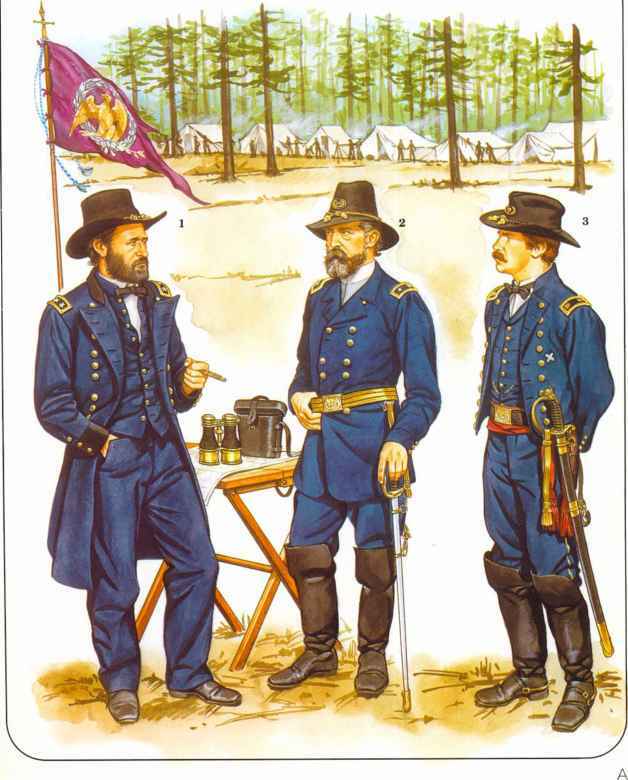 The Navy also formed a land brigade for the defence of Richmond in 1864-65, which surrendered with the Army of Northern Virginia at Appomattox on 9 April 1865.
lieutenant's stripe had an 'executive' loop, while the commander's top stripe looped up and the bottom stripe looped downwards. Epaulettes, apparently of US Navy type, were also worn for general musters. Caps were also US Navy types. 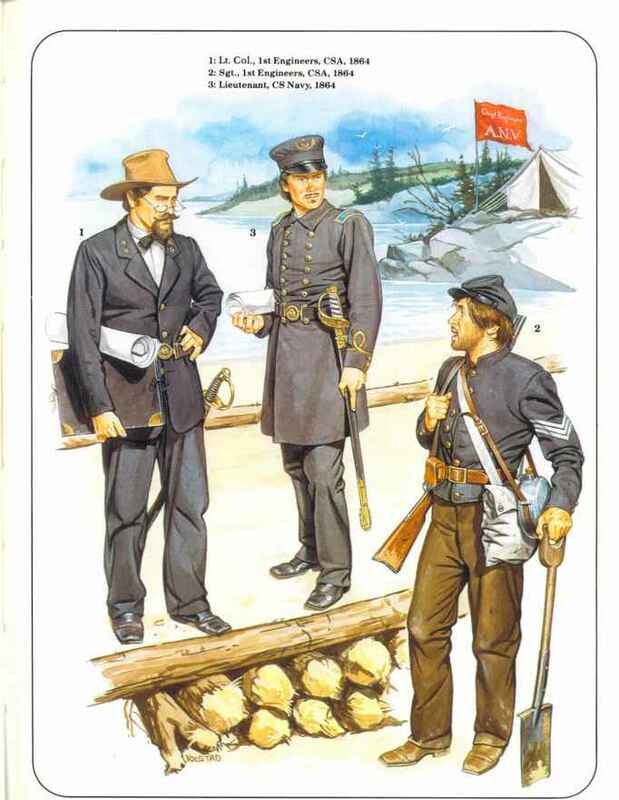 In 1862, after the return of the Sumter, the Navy issued dress regulations. Since indigo, used for dyeing cloth blue, was no longer available in the South, the overall naval colour was ordered to be steel grey. Caps were to be between 4 ins. and ins. tall, with a patent leather peak and a gold band. Cap badges were, for executive officers, a fouled anchor within a wreath. Stars over the anchor indicated rank; four for a flag officer, down to one for a lieutenant. The master had no stars, while a passed midshipman wore only a wreath. Plain wreaths were also worn by assistant surgeons and paymasters. Engineers wore an Old English letter 'E' within the wreath, under stars indicating their relative rank. 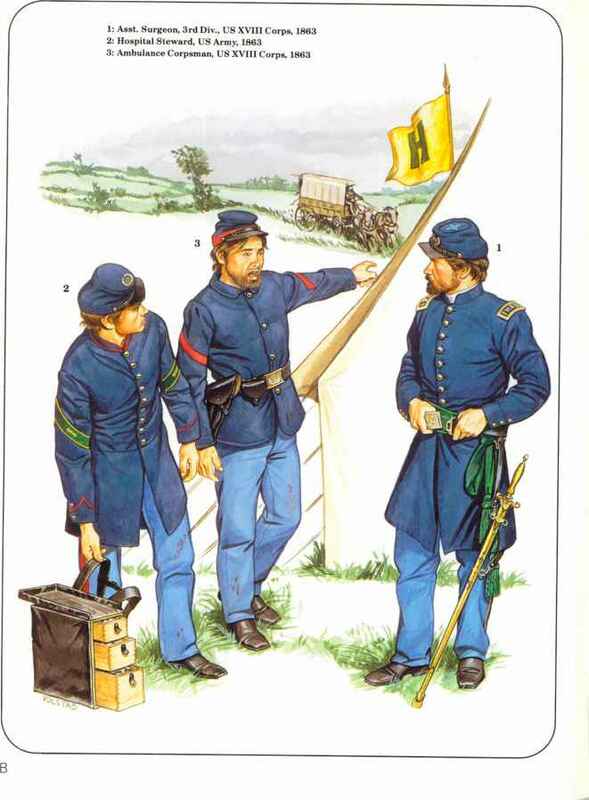 On 19 June 1863 it was ordered that volunteer officers were to wear the plain gilt 3^-in. letters 'VN' on their cap fronts. Straw hats were also allowed in the summer. Chaplains had the same coat, but with only one row of nine buttons down the front. 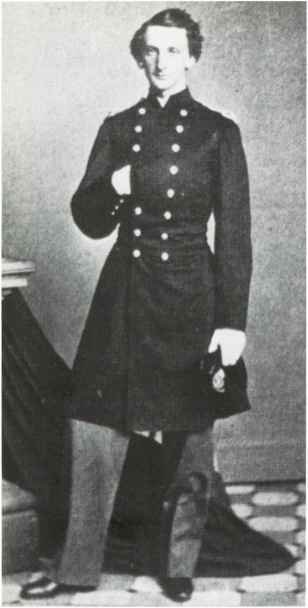 Professors and commodores' secretaries wore single-breasted coats with eight buttons, while clerks had only six buttons in a single row. 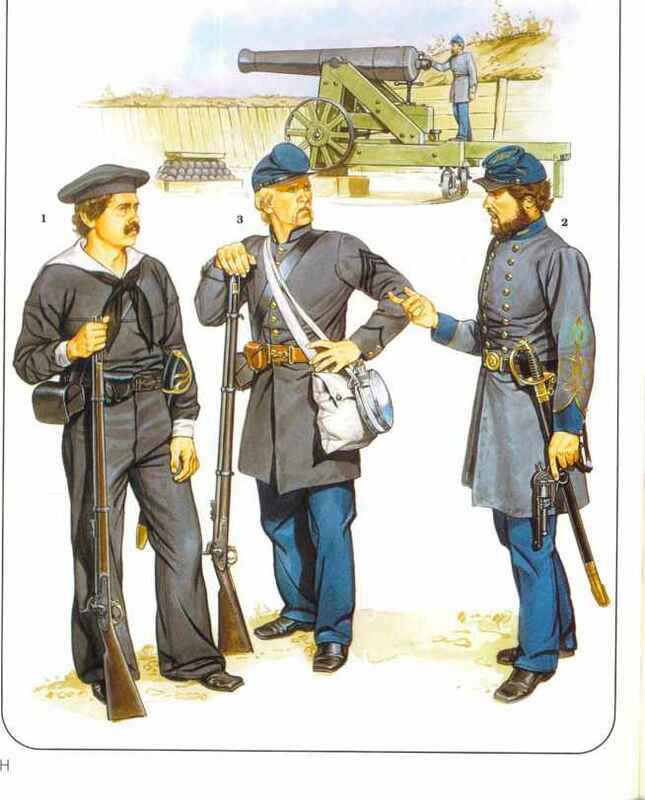 In 1862, after the return of the Sumter, the Navy issued dress regulations. Since indigo, used for dyeing cloth blue, was no longer available in the South, the overall naval colour was ordered to be steel grey. Caps were to be between 4 ins. and 35 ins. tall, with a patent leather peak and a gold band. Cap badges were, for executive officers, a fouled anchor within a wreath. Stars over the anchor indicated rank; four for a flag officer, down to one for a lieutenant. The master had 110 stars, while a passed midshipman wore only a wreath. Plain wreaths were also worn by assistant surgeons and paymasters. Engineers wore an Old English letter 'E' within the wreath, under stars indicating their relative rank. On 19 June 1863 it was ordered that volunteer officers were to wear the plain gilt 3iJ-in. letters 'VN' on their cap fronts. Straw hats were also allowed in the summer. years. A passed assistant surgeon wore one olive leaf at each end of his straps. Rank was also indicated by cuff stripes. These were gold, \ in. wide, separated by a space % in. wide. A gold lace stripe also ran up from the cuff edge, along the rear cuff opening, to the bottom stripe. Executive officers had a 3-in. loop on their top stripe, while civil officers had all their stripes parallel with the cuff edge. Flag officers wore four stripes (one admiral wore five); captains and civil officers of that relative rank wore three; commanders, two; and lieutenants, one. Masters and civil officers of that relative rank wore a ¿-in.-wide stripe. Passed midshipmen wore three medium-sized Navy buttons parallel to the cuff edge, while midshipmen wore the same buttons but no shoulder straps. Chaplains, professors, secretaries, and clerks had plain cuffs. •No Confederate Navy officers, obviously, could have held their Confederate Naval ranks for over 12 years. above the letters 'CSN' within a rope border. Many officers, including Adml. Buchanan, wore their state buttons, however. 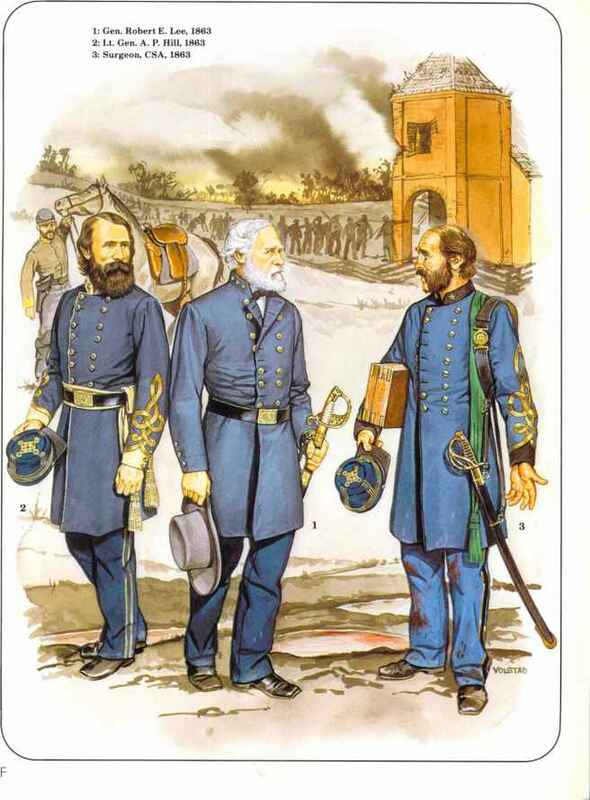 Two-piece beltplates were also made in England and bore the same design as the Firmin-made button after April 1863. Another, earlier type of British-made two-piece beltplate simply had the letters 'CN' on the male part of the plate. 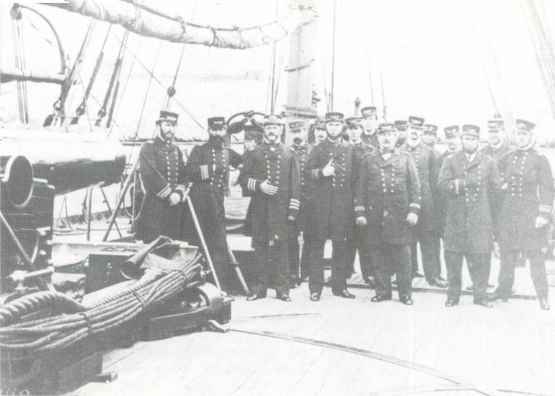 Many officers were not happy with grey coats and hats, as one of them wrote, 'contemptuously demanding to know, "Who ever had seen a gray sailor, no matter what nationality he served?'" 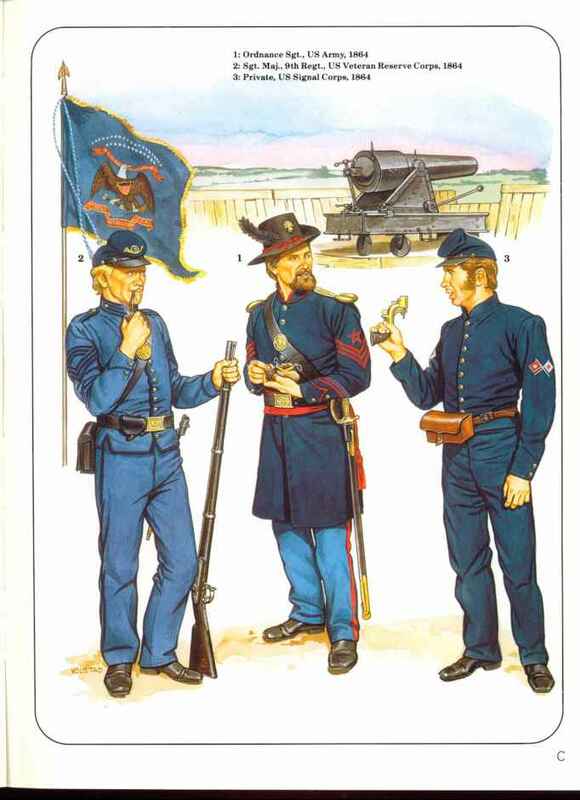 And, indeed, blue uniforms survived throughout the period. El. 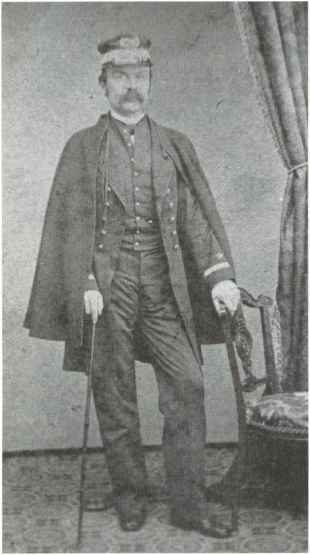 George Gift, CSS Gaines, wrote in September 1863 that he looked elegant in his 'dark blue flannel suit.' Most, however, wore regulation dress. This matches the first uniforms ordered by the Navy's purchasing agent in England, James D. Bulloch. They included blue flannel overshirts, undershirts and underdrawers, blue cloth caps, black silk handkerchiefs, cloth or cassinette pants, cloth jumpers, round jackets, duck pants, shoes, woollen socks, blankets, pea jackets, and 'Barnesley shirting frocks' for 1,000 men. Most Confederate seamen recruited or equipped outside the South wore this type of dress. 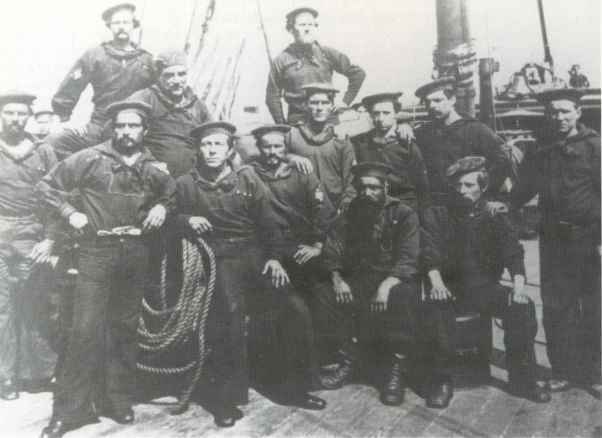 Sailors on the CSS Alabama were described by Lt. Arthur Sinclair as wearing 'our paymaster's nobby blue-and-white uniforms.' Offic ers were, however, photographed in regulation grey. 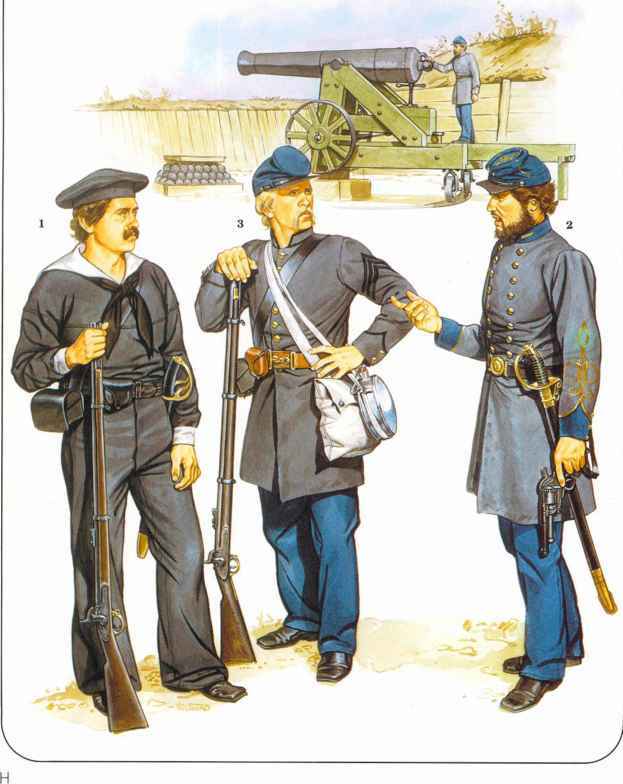 Sailors in the South appear to have received by late 1863 uniforms that agreed with the 1862 regulations. They consisted of 'gray cloth jackets and trousers, or gray woolen frocks with white duck cuffs and collars, black hats, black silk handkerchiefs and shoes, or boots in cold weather. In warm weather it shall consist of white frocks and trousers, black or white hats, as the commander for the occasion directs, having proper regard for the comfort of the crew; black silk handkerchiefs and shoes. The collars and cuffs to be lined with blue cotton cloth, and stitched round with thread. Thick gray caps without visors may be worn by the crew at sea, except on holidays or at muster. 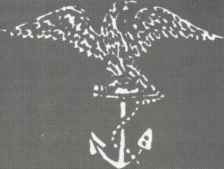 'Boatswains Mates, Gunner's Mates, Carpenter's Mates, Sailmaker's Mates, Ship's Steward and Ship's Cook, will wear embroidered in black silk on the right sleeve of their gray jackets above the elbow in front, a foul anchor of not more than three inches in length. The same device embroidered blue to be worn on the sleeves of their white frocks in summer. awarded for every additional discharge. The Navy made its own canvas shoes for seamen in a plant in Mobile, Alabama. Buttons for pea jackets were made in Britain from a black composition material. These had the design of a foul anchor, upright, over a pair of crossed cannon above the letters 'CSN' within a rope border; they also had four holes through the centre for sewing to thejacket. These buttons were first ordered in about April 1863. .Naval Accoutrements and Weapons The belt for seamen, according to the 1864 Confederate States Navy Ordnance Instructions, was 'to be made of buff leather, 2 inches w ide, and from forty to forty-four inches long; a standing loop and eyelet-holes at one end and a brass hook riveted to the other.' An original surviving belt is similar to this, but is made of heavy canvas. English-made pouches for gunners' fuses and implements were stamped with the foul anchor and crossed cannon design found on officers' buttons. Naval ordnance instructions call for the letters 'CSN' to be stamped on musket cartridge box flaps. 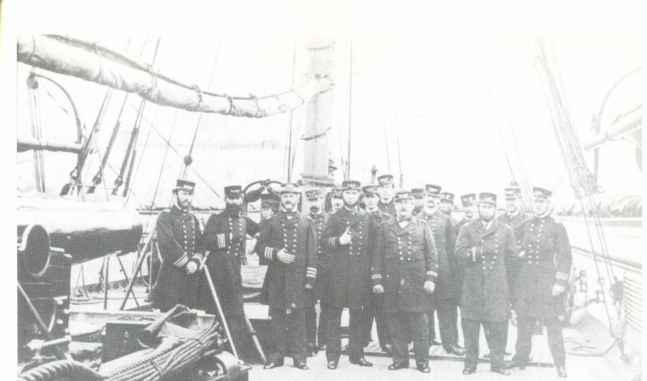 Otherwise, accoutrements were similar to those of the US Navy. Mhe Navy British-made 0.54 cal., breechloading rifles made to a design patented by T. Wilson. At the same time, Bulloch was to purchase 1,000 'navy revolvers', and he bought Kerr pattern revolvers lor the Navy. The Navy also ordered 2,000 French-made Le Mat revolvers on 7 April 1864. (Three Le Mat revolvers were captured on the CSS Atlanta.) Designed by a Southerner from New Orleans who had moved to France, this weapon was a novelty in that it had a cylinder holding nine 0.42 cal. pistol rounds which revolved around a 20 gauge smoothbore 'shotgun' barrel. Such a weapon could be useful for shipboard fighting; however, Confederate Navy inspectors said that their quality was generally poor. Seamen carried cutlasses when required. Southern-made cutlasses were copies of the US Model 1841 and Model i860 types (mostly the M 1841), while the Navy also imported a number of Royal Navy-type cutlasses. Officers' swords were often imported from Britain, too. Firmin's were the largest supplier; their sword was like the Royal Navy officer's pattern with the foul anchor and crossed cannon cast into the hilt. What rank was a navay paymaster in the confederate navy? What is the rank of a paymasters in the confederate navy? Where was the USS Hunchback stationed in 1863? What insignia did confederate navy warrant officers wear?